This is the ongoing story of the beautiful journey God has blessed us with so that we may draw closer to Him. The following people have graciously donated to our adoption fund and have made Greta, Felix, & Romeo one step closer to becoming "An Orphan No More"! WORDS CANNOT EXPRESS OUR GRATITUDE!!! WE ARE FOREVER BLESSED AND HUMBLED!!! WooHoo!! We have ALMOST reached our fundraising goal for our Prize Giveaway & Name Reveal drive!! 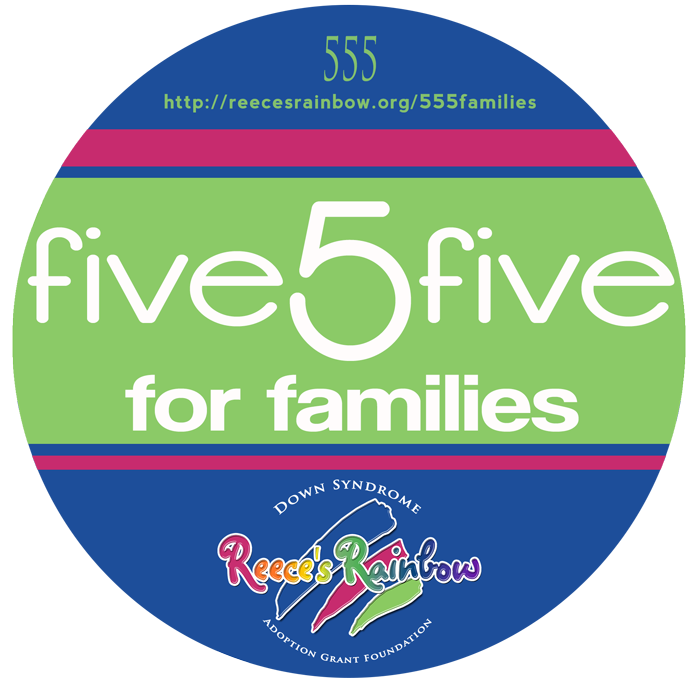 Our Reece's Rainbow Family Sponsorship Page (FSP) grant is currently at $6,334.69 and our goal was for it to read $6,500. So, we are ONLY $165.31 from meeting the goal!! AND, another beautiful thing about $6,500 is that this amount will make us FULLY FUNDED for our adoption of precious Greta, Felix, and Romeo!!!!! YES, you read that correctly: WE ARE ONLY $165.31 FROM BEING FULLY FUNDED!!! GOD is sooooo good! He has proven Himself faithful once again in His promise to work out all of the details for our family as long as we remain obedient to His command. Although I am in no way surprised by His blessings, it still places me in a state of unbelievable awe that is just unexplainable. David and I cannot help but fall to our knees in reverence of this awe, fully knowing that we are unworthy. But, in our unworthiness, we are humbled through the very important reminder that HE IS WORTHY. His worthiness allows us to receive His grace and blessings. 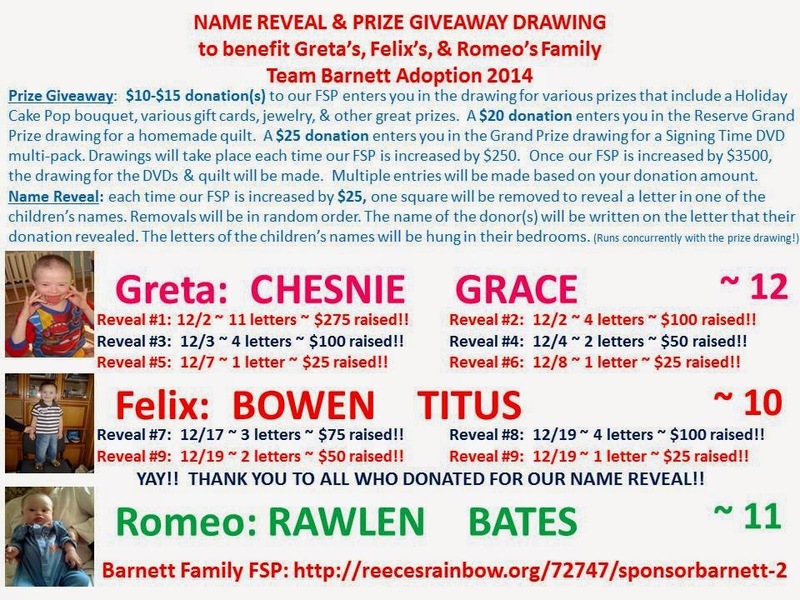 I am beyond thrilled to have their names revealed because, in my mind, it allows Greta, Felix, & Romeo to almost loose their orphan status ~ it allows the world to finally see their FOREVER NAMES given by their FOREVER FAMILY!! How beautiful is that?!? Oh, I cannot wait to be able to call them by their forever names in person!! And, once their adoptions are finalized ~ in a matter of just weeks ~ they will loose their orphan status FOREVER as the officially become Chesnie Grace, Bowen Titus, and Rawlen Bates!! WOW, simply wow! 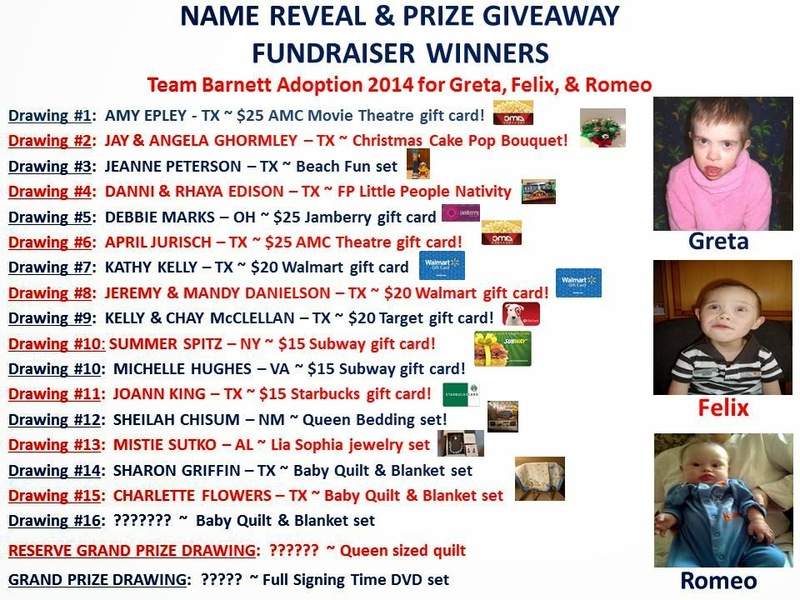 Once our RR FSP reads, $6,500.00, I will draw for the final three prizes: the last homemade baby quilt/blanket set, the homemade queen-sized quilt, and the Signing Time full DVD set. To make the homemade quilts extra special and meaningful, it is my plan to purchase the material for the quilts in-country during my first trip to Ukraine (I leave on 1/19 for Ukraine). This material will allow the quilts to serve as a constant & personal reminder that three special needs orphans from Ukraine were given a forever family as a result of the support from numerous people. It is my hope that each time the winners are physically warmed by the quilts, their hearts will be warmed that much more knowing that three Orphans No More are also warm and secure in their new found love!! As a sidenote, we are praying to be fully funded by the time I leave for Ukraine on my first trip. As mentioned above, I will be leaving on Monday, January 19th. With the Grace of God, I will get to hold one of my precious babies in my arms by Friday, January 23rd!! Oh, this has been a long time coming!! PRAISE GOD that this is now only 2 1/2 weeks away!!! David and I cannot even begin to thank all of you who have journeyed with us to bring Greta, Felix, & Romeo home enough. We are forever blessed and humbled by such an outpouring of love and support. We are so blessed to have friends and family who love and accept our children ~ those who have a heart for individuals with Down syndrome. Thank you for knowing that their lives matter and that they are worthy! “Who is like You among the gods, O Lord? Click on our Adoption Button below to see how you can help us bring our children home! 26 December 2014 ~ Travel dates have been issued! I leave for Ukraine on Monday, January 19!! With the Grace of God, I will be holding one of my precious children in my arms by Friday, 1/23!! 2 December 2014 ~ Our Name Reveal and Prize Giveaway is launched as a final adoption fundraiser. Our goal is to raise $3500. 27 November 2014 Thanksgiving Day ~ our adoption dossier is submitted to the Ministry of Education and Children (the DAP) in Ukraine!! Now we OFFICIALLY officially wait for our travel dates!! By the Grace of God, we should be in Ukraine in just a FEW short weeks!! PRAISE GOD!! 9 November 2014 ~ Ds Awareness T-shirt fundraiser ends with $388 raised for our adoption!! 24 October 2014 ~ Received USCIS approval to adopt ALL 3 children!!! The Golden Ticket ~ I-171H!!! PRAISE GOD!!! 21 October 2014 ~ Down syndrome awareness t-shirt campaign launched to raise funds for our adoption. 50 t-shirts MUST BE SOLD by 11/9 for the campaign to go through! Click HERE for details. 30 September 2014 ~ FBI fingerprinting appts. Our results were received within an hour!! WooHoo!! 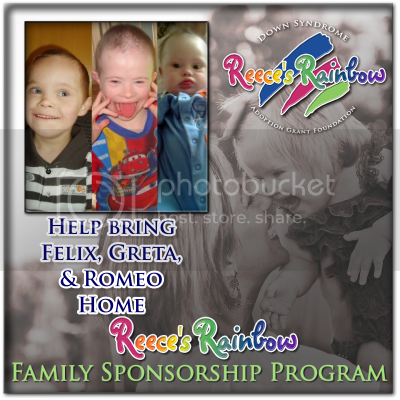 16 September 2014 ~ Went public with the news of adding Romeo to our adoption of Greta & Felix. God is good!! 26 August 2014 ~ Full Homestudy COMPLETED & APPROVED!! Praise God!! 6 August 2014 ~ Medicals for our adoption are finally complete!! 7 Feb 2014 ~ Our T-shirt fundraiser begins through Bonfire Funds (click here for details)!!! 4 Feb 2014 ~ We are OFFICIALLY committed to Felix through RR!! 22 Jan 2014 ~ All paperwork & fees sent to RR! YAY!! 23 Dec 2013 ~ Felix becomes available to us!! 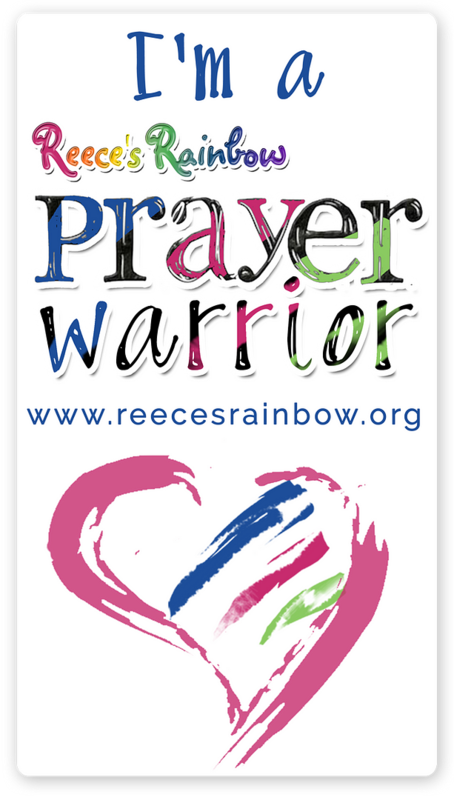 Reece's Rainbow's New Campaign for families who are in the process of adopting!!! CLICK to share 555 Families on your blog!